Signing off and toasting: Here’s to rocking those 2019 wellness blog trends. It’s that time of year full of resolutions for us and our clients. What feels like a fresh start gives way to fresh hope and fresh commitments. Whether you’re starting a wellness blog, re-igniting it, or ramping it up big time, here are some 2019 wellness blog trends to consider. Last year the wellness industry grew to a whopping $4.2 trillion (that’s huge!). Right now is an absolutely amazing opportunity because more and more people are spending more and more money on their wellness. Whether you offer services (e.g. nutrition consulting, personal training, etc.) or products (e.g. health foods, fitness gear, etc.) you live in an awesome time, my friend! This also means that more and more people, qualified or not, are launching wellness brands to get their piece of the pie. Lots of people are seeing and predicting where 2019 is going for wellness. We all know industry trends come and go (and most often it’s way faster than the science that proves if these trends even help!!! – see #3 below). Do you know how many health-related scientific studies are published each year? Hundreds of thousands! Of course, you don’t need to read, interpret, and critically evaluate every single study in your niche. But, definitely keep your finger on the pulse of what’s new and relevant for you and your audience. This way you can learn what’s going on and jump into the conversation when it’s happening. I’ve been known to bump my regularly-scheduled blog post for a new hot, trending topic from time to time – like when recreational cannabis was legalized in Canada, when a study out of the University of Alberta found heavy metals in every prenatal vitamin supplement in Canada, or when California ruled that coffee needs a cancer warning. And watch out for fake health news – that stuff spreads so far, so fast. Sadly, it happens when people misinterpret or overexaggerate studies/legal rulings, take one person’s experience as a universal public health recommendation, or simply make up BS that spreads fear, disgust, and surprise to divide and conquer the population. Content marketing includes your blog, email newsletters, social media posts, online advertising, etc. It excludes paid advertising because it relies on providing valuable content to your audience to build their “know, like, and trust” factors with you over time. If you’re sick of seeing ads everywhere, your (non-online entrepreneurial) ideal clients have been sick of it for even longer! The benefits of content marketing are insane when compared with paid advertising. It’s just so, so worth it. I’ve been helping a few clients improve their blog content and domain authority using keyword research and SEO-optimization strategies. Their competitors are doing the same thing! As my clients’ numbers improve, so do the numbers of the websites they’re trying to outrank. Because content marketing is so awesome for business, more people are using it more strategically. The crowded online wellness marketplace is getting more competitive. Even though there are more people spending more money in the wellness industry (hello $4.2T) – whatever you did last year can be improved, at least a bit, for 2019 – amirite? So, if you increase your efforts by, say 10-20%, you may end up in the same spot as you were in 2018 (because your competitors are working harder too). So that means similar traffic, engagement, conversions, and income. But, if you increase your efforts by, say 50-60%, you may well end up 30-40% farther ahead than in 2018. Create better quality more engaging content – be it blog posts, videos, podcast episodes, infographics, or social media posts. Do this by really honing in on your niche and your ideal clients and make sure your blog posts are clickable, interesting, visible, shareable, subscribable, and sellable. 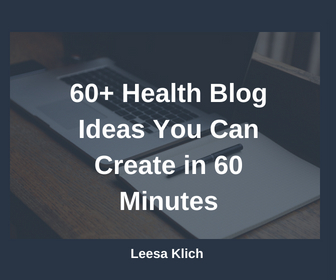 Begin with my Ultimate Health Blogging Checklist. Start or ramp up your SEO efforts. Getting found by Google is, IMO, waaaay better than constantly pushing social media. People are finding you exactly when they’re searching for what you have to offer – they’re “warm” traffic. And, once you’re on the top of page 1, you have zero maintenance – the traffic flows effortlessly to you every single day. PRO TIP: I’ve tasted the benefits of ranking on Google while ditching some social media time (if you’ve been tagging or trying to contact me on FB, please just email me). This means I’m really focussing on SEO in 2019. More keyword research, on-page optimization (e.g. quality content, internal links, etc. ), and off-page optimization (e.g. guest posts, interviews, etc.). In fact, I’m investing in SEO in a big way: I recently upgraded my SEO plugins and software and am going through Yoast’s SEO Academy to really rock the search engines in 2019! The wellness industry is growing fast, so knowing (and creating) trends is great for 2019. This year is going to be a bit harder for you to grow your traffic, subscribers, leads and sales online, so check out the resources I have linked above to start ramping up your content marketing game to boost your biz in 2019. What do you think? 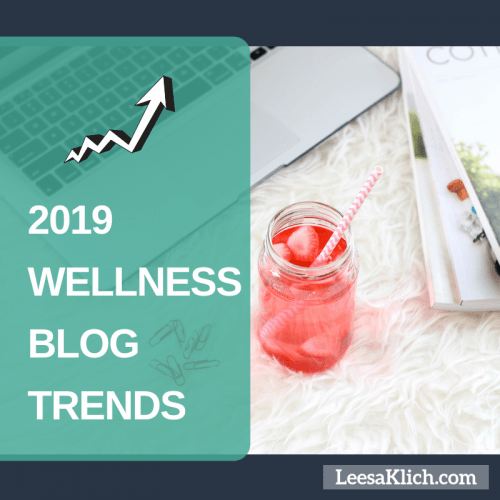 Are you ready to watch and create your own 2019 wellness blog trends? Do you have a content marketing digital strategy that’s going to grow your biz in 2019?